Last week Icelandair tried something new: an 11-hour immersive theater production that took place on a flight from London to New York, with an on-the-ground bonus performance during a short layover in Reykjavik. I got to ride along. The cast was a mix of professional actors from the London theater group, Gideon Reeling, and real airline employees, including pilots, engineers, accountants, ground workers and cabin crew, who had volunteered to attend a special stage school. The characters ranged from film stars and flight attendants from various decades to a perky party planner, a stone-faced volcanologist, a ram farmer and a pair of barefoot, beaded hippies. And the plot was built around Icelandair’s 80-year history, its can-do philosophy and themes of empowerment for women. The show – such as it was – took place on board, as the characters mingled with passengers, telling stories about their role in what turned out to be a kooky and somewhat complicated family all headed to a party for Edda who (spoiler alert…) never appeared. I’m finishing up a story for NBC News about the event, but here are some snaps from the flight. Passengers on Alaska Airlines will be able to use their personal electronic devices to access the airline’s full range of ‘Alaska Beyond’ inflight entertainment for free through March 31st. But starting April 1, it will cost $1.99 to get access to movies and TV shows beyond a basic selection of complimentary offerings. The new entertainment service was introduced in mid-December and is available now on more than half of Alaska’s mainline aircraft and should be on nearly all of the airline’s planes by April 2015. For those not traveling with their own personal electronic devices, starting Feb. 1, Microsoft-branded Inflight Entertainment tablets will be available to rent on long-haul flights for $8-10 and will feature movies, TV, XBOX games, music, digital magazines, and Internet access on WiFi-equipped flights. 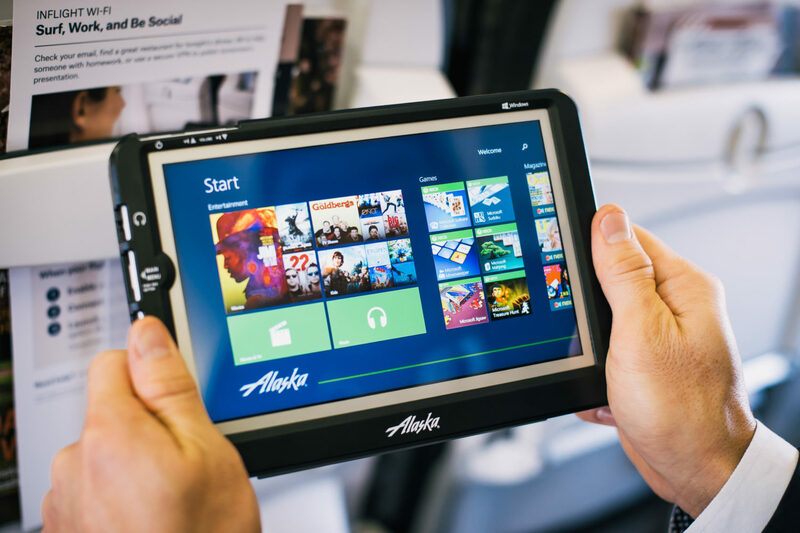 As with Alaska’s old rentable tablets, First Class customers and MVP Gold75Ks will be able to use the new tablets for free. You might learn something new next time you take a Virgin American flight. Starting February 1, free audio and video lectures from the popular series The Great Courses will be available on the airline’s Red in-flight entertainment system. The series library runs to more than 530 titles and covers everything from history and music to science, literature, language, health, nutrition and personal development. • How People Respond to Incentives; from the course, Thinking Like an Economist: A Guide to Rational Decision-Making. United is not the first to begin offering on-demand programming to passengers’ personal devices. “Many airlines are rolling out this ‘from the Netflix server on the plane to your device via Wi-Fi’ option for passengers,” said John Walton, direct of date for Routehappy. Fliers get a wide range of content “often for no more than the price of downloading it from iTunes and, for airlines, it’s a lot cheaper and lighter than installing a seatback entertainment system,” he said. For a fee, passengers on many American Airlines, Delta and US Airways flights can stream on-demand movies and TV shows via Gogo Vision. Other airlines streaming to passenger devices include Air Canada, El Al, Norwegian, Scoot and Virgin Australia. “Southwest offers streaming video plus streaming live TV, while Qantas offers streaming to the airline’s own iPads, which are rigged to the seat in front of you in a kind of sling,” said Walton. (My story about changes in in-flight entertainment first appeared on NBC News Travel).